Located in Valdosta, Ga. U.S.A.
Take exit number 16, Highway 84 east towards Valdosta. Continue through downtown Valdosta on highway 84 east. Continue on HWY 84 approximately 2 miles from the center of town and watch for the South Georgia Pecan Company on the left. Turn left (north) on Blanchard Street. just past South Georgia Pecan Company. 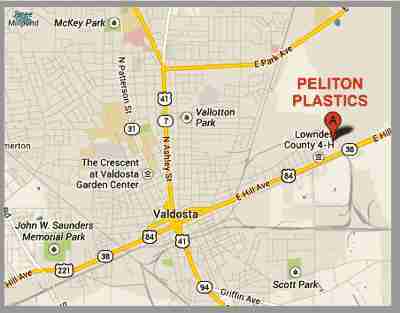 You will find the Peliton Plastics entrance on your left. In downtown Valdosta, GA turn on highway 84 east. Continue approximately 2 miles from the center of town and watch for the South Georgia Pecan Company on the left. Turn left on Blanchard Street. just past South Georgia Pecan. 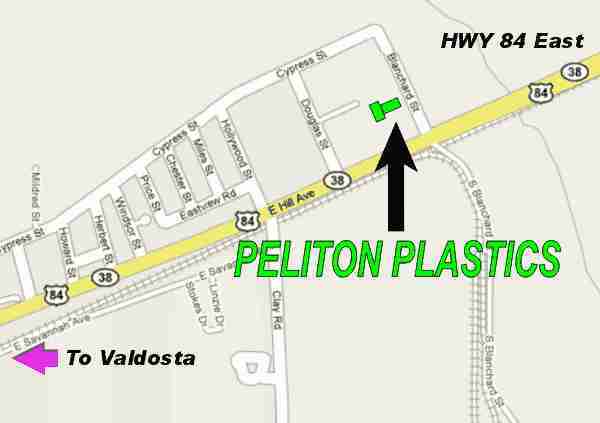 You will find the Peliton Plastics entrance on your left. Hope to see y'all real soon! Custom Plastic injection molding, and mold repair.